Planning where the visions and goals of the community are discussed and established and a means of achieving the goals are determined. Implementation where the goals from the planning stage are brought to reality through projects or regulations. 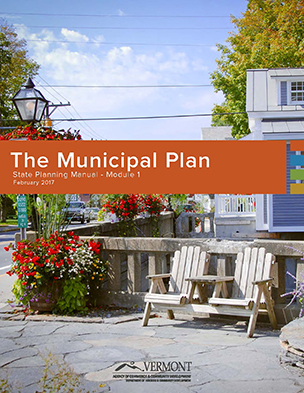 The Community Planning Toolbox introduces users to the issues, techniques and resources for planning for Vermont's downtowns and villages, as well as the natural resources that surround them. It features case studies and sample tools that demonstrate how other communities have addressed similar challenges to those facing your community. Also visit the Agency of Commerce & Community Development's Land Use Planning page for information on local land use planning and regulation. Below are handbooks, manuals, templates, check-sheets and other tools with information on local land use planning and bylaw adoption, development regulation and review, and the state rules (24 V.S.A. Chapter 117) that govern these activities. These handbooks, manuals, templates, check-sheets and other tools are divided into four sections. You can browse them by the following: For All Local Boards, Commissions & Staff, For Planning Commissions, For Zoning Administrators or by For Development Review/Zoning Boards & Other Appropriate Municipal Panels. Provides an easy-to-read overview of the local planning and regulatory processes and the roles and responsibilities of the various players - just what new members need before stepping into their first board or commission meetings. Provides an overview of municipal roles and responsibilities and the fundamentals of local planning and permitting in Vermont - what every board and commission member needs to know. Includes audio and visual materials. Full Statutory Language of Chapter 117 is available through Vermont Statues Online. ACCD has compiled the most recent statutes relevant to local planning and regulation. It will be updated annually and available online. A published booklet, "the Purple Book," that includes the Associated Sections and the Downtown Development Act, as well as related statutes may be available from your Regional Planning Commission. These bulletins explain the 2004 changes to Chapter 117 and implications to planning, zoning, development review, housing, and more. The Vermont Land Use Education and Training Collaborative developed the bulletins to provide a comprehensive summary of the Chapter 117 changes. Provides information that will help planning commissions with the complex task of developing the municipal plan, from designing the planning program to adopting the plan and with information about state designation programs. Reissued by the Vermont Department of Housing and Community Development in February 2017. A package of 33 topic papers introducing a wide range of concepts, tools, and techniques for helping communities achieve their planning goals. Forms and checklists for municipal plan and bylaw preparation and adoption. Addresses sections 4385 and 4441-4447 of 24 V.S.A Chapter 117. Note: This document was updated in March 2017. Please use this version to replace earlier versions. Addresses sections 4412, 4413, 4462, 4464 and 4471 of 24 V.S.A Chapter 117. This document provides sample language and commentary for updating the procedural sections of municipal zoning bylaws to meet the Chapter 117 requirements adopted in 2004. The aim of this handbook is to provide the zoning administrator (or equivalent) with an understanding of some basic principles of zoning administration and enforcement and their application to a wide range of problems likely to be encountered. To see the procedural flowchart of the permitting and appeals process click here. This notice form is meant to be posted at any project site to inform of permit issuance or announcement of a hearing date in conformance with sections 4449 and 4464 of Chapter 117. It has spaces for information on the type of permit, the appeal deadline and public hearing information. This poster is designed to be printed onto an 11"x17" piece of card stock paper. This is the email listserve for Vermont Zoning Administrators. It is meant for communication and sharing of information about zoning, development review and other topics relevant to Zoning Administrators and their work. Provides an overview of various local development review topics including rules of procedure, development review skills, associated legal issues, and special topics. All Appropriate Municipal Panels must adopt rules of procedure and conflict of interest policies as per 24 VSA Sec 4461(a). This manual includes two sample Rules of Procedures with accompanying Interested Persons Record Lists, plus an introductory section explaining them. Templates for development review hearing notices, findings of fact and decisions. Addresses sections 4461, 4462 and 4464 of 24 V.S.A Chapter 117.